The goose migration is highly weather dependent. In most cases snow geese and specklebellies lead the goose migration south and the Canada geese stick it out up north as long as possible. The colder it gets, the further south the dark geese move. As we enter the tail end of the waterfowl migration, the weather continues to push birds into places unreached the past few years. 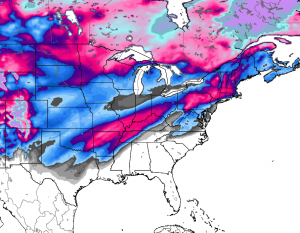 The winter that keeps on giving has recently blanketed a large portion of the midwest in 6+ inches of snow and ducks and geese have been forced to migrate even further south that they already had. A coming moderation in temperatures coupled with weekend rains will lead to an expanse of resources and likely spread waterfowl over a much larger area than they are now. When it gets to this point in the season, many ducks located north of I70 are pretty much locked in place. These tend to be older birds that are tough and will stick it out to the end. There are still many ducks located in these areas thanks to warm water lakes and deep strip pits that have open water. Even with snow cover, these birds are resourceful and find ways to survive through these harsh conditions. In areas to the south, waterfowl have made a move. Ice has been noted across Texas, Oklahoma, and Arkansas. This has pushed many ducks further south from these locations and concentrate what stayed. As open water decreases, birds move to look for more roosting areas. Those that remain are confined to river systems that have remained open. Field hunting has become the dominant tactic, but hunters show run ice eaters or break holes in small bodies of water are having success as well. Canada geese made a migration south on Monday after the snow stopped. Large flocks of migrating honkers were reported across many areas of Missouri and Illinois. Some stopped in areas along the Missouri River in Missouri as well as south central Illinois, but many continued on to get below the deep snow pack. Canada Geese were even noted as far south as the bootheel of Missouri, Kentucky, and Reelfoot lake. Crab Orchard, in Illinois, picked up thousands of geese on Monday. While it’s not quite like it was back in the glory days, it way more geese than have been in southern Illinois in many years. A few light geese are still in Kansas, central Missouri, and central Illinois, but the vast majority have made their way to their wintering grounds in Texax, Arkansas, Louisianna, and Mississippi. What flocks were left to the north quickly made their way south riding the strong northwest wind on Monday. Temperatures through the rest of the week will moderate and and a rain system will help recede the snow line. With all of the rainfall and melting snow, available water sources will be vast. Instead of waterfowl being concentrated on areas of open water, they will spread out over the new resources just as they did a few weeks ago. This will make hunting much tougher as the ice melts. Couple this with the education they’ve received over the past 4 months, and late season hunting will be at it’s toughest as we enter the homestretch of the 2013-2014 waterfowl migration. The peak of the waterfowl migration has come and gone for some places, but for others now offers some of the best hunting of the year. The weather that most of the country has been without the past couple season set in last week and pushed the waterfowl migration southward. As the arctic airmass has now moved on, the question is what will ducks and geese do in response to moderating temperature and melting snow and ice. Large numbers of mallards have been reported in Oklahoma, Kansas, southern Missouri, Arkansas and Tennessee. Over the weekend, many of these places were still fighting frozen water sources and ducks were confined to what open water was around. Most of the water sources are now thawing out and the snow in these areas has melted. With the new abundance of water comes the availability of new food sources. Large concentrations of ducks are hard to come by, but if you find a new food source they’re using, you’re in for a great hunt. Further north, some water is thawing out and there are still ducks all the way up into South Dakota. Even with sub freezing temperatures, the hardiest of the mallards are reluctant to push south without a substantial snow pack covering their food source. The snow that fell across the Plains and Midwest last week pushed the goose migration into parts virtually unreached in a few years. Migrators were reported across Kansas, Oklahoma, Missouri, and even some south of I-70 in Illinois. The fresh snow pack lead to lots of limits of geese for hunters along and north of I-70 through all of these areas. The southernmost geese will likely push back north as the snow line recedes, but they’re only one goose storm away from returning to these areas. The bulk of the specklebelly and snow goose migration has entered it’s wintering grounds across Oklahoma, Texas, southeast Missouri, Arkansas, and Louisianna. Smaller numbers of geese are in southern Illinois, central Missouri, and Kansas. A brief warmup is underway today. Temperatures are well above normal across many areas and a strong wind is blowing out of the south. There have been little reports of a reverse migration. Maybe tomorrow will be different, but it appears the bulk of waterfowl are staying put for the time being. A fresh coating of snow is forecast to fall across Kansas, northern Missouri, Iowa, and into Wisconsin. This should help to push ducks further south out of these areas and some geese should migrate as well. After this weekends system, the weather pattern looks to relax a bit as we enter the week of Christmas. There are currently no major systems forecasted and temperatures should remain around average. A strong cold front is moving across the country with a pair of low pressure systems bringing a mix of wintery weather across much of the country. The wind, falling temperatures, and snow has waterfowl migrating hard across much of the Central and Mississippi Flyways. It’s not going to be a matter of will they migrate, it’s where will they stop. Starting on Tuesday, this system began to enter the Dakotas where many ducks were still present. Two to twelve inches of snow fell across the area and temperatures are in the teens to below zero. Last week, we talked about the abundance of mallards on the Missouri River in South Dakota. Nearly 900,000 ducks were surveyed there on November 26th. The latest survey from December 2 counted over 573,000 ducks. This survey was before the storm hit and from the reports out of Nebraska are numerous high flocks of mallards southbound. By next week, there should be very few ducks left in the Dakotas. When all is said and done with this first storm, the snow line will be from western Nebraska through southern Minnesota, and Wisconsin. A second band of snow and ice will be across Oklahoma, southerm Missouri/Illinois, and northern Arkansas. The arctic front associated with this system is currently across Arkansas, Tennessee, and western Ohio. Most locations in northern Oklahoma, northern Arkansas, and Illinois will not climb above freezing for the foreseeable future. 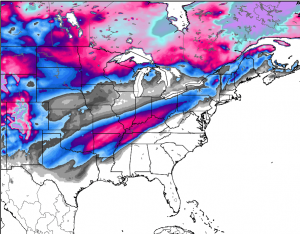 A second system looks to drop snow across Nebraska, Kansas, Iowa, and northern Illinois starting on Sunday bringing the snow line even further south. The way things are setting up, there could be a gap in the snow field or at least an area where snow cover is at a minimum from north-central Illinois through western Missouri and into southeast Kansas. The waterfowl migration will be in full swing over the course of the next week. Projected Snowcover by Monday December 9th. Large number of dark geese have been migrating through the Central Flyway. Migrating geese have been noted in the same locations as the ducks. Geese are more apt to ride out cold weather and snow as long as they have a food source. Look for some, but not all to come out of the Dakotas, central Minnesota and central Wisconsin. By next week, look for geese to be in good numbers across Nebraska, Kansas, Missouri, and into central Illinois. Just as the ducks and dark geese have been migrating, so have the light geese. Large numbers have been noted across Illinois, Missouri, and Kansas. The cold weather should continue to move them south into Oklahoma, Texas, Arkansas, and Louisianna. The question is where will everything end up after these two systems are done? River and field hunting across much of the middle of the country should be great. If there is open water and minimal snow cover there will be ducks. The cold weather will continue to lock up bodies of water and where snow has fallen, it will likely stick around. By early next week, even larger lakes should start to freeze up. Feeding patterns should be easy to figure out due to the cold weather and field hunting will be hot as waterfowl need the carbs for energy. If you are a duck or goose hunter this next week could be filled with lots of birds and little sleep! A series of sharp cold fronts over the past 10 days pushed some of the waterfowl migration further south as water began to freeze up across areas of the upper midwest and central plains. The colder weather and north winds have brought good success to hunters across much of the country, but temperatures look to rebound slightly as we move through the weekend. After above normal temperatures a week ago, the first in a pair of arctic cold fronts swept across the country from Canada starting last Thursday. Temperatures dropped 20-40 degrees in most locations and a strong north/northwest wind accompanied the front. Water sources began freezing quickly across the Dakota’s, Minnesota, Wisconsin, Iowa, and Nebraska. As the front continued south, small bodies of water locked up across Kansas, Missouri, and Illinois. Early migrators such as teal, pintails, and gadwall have made their way into southern Illinois, Kansas, Oklahoma, southern Missouri, and Arkansas. The leading edge of the large numbers of mallards have migrated into Nebraska, Missouri, and northern Illinois. Over 1 millions ducks have been surveyed across the managed areas in Missouri with 3/4th’s of them being mallards. In Illinois, the waterfowl migration seems to be sticking close to the rivers thus limiting the number of waterfowl surveyed across areas such and Rend Lake and Carlyle Lake. Their numbers have been dramatically lower compared to past years while the Mississippi and Illinois Rivers have been above average. Will those trends change is the question as we enter the heart of the waterfowl migration. You hear waterfowl hunters talk about the stages of the migration. There are calendar, ice, and snow line waves. The calendar birds have migrated their way into southern parts of Kansas, Missouri, Illinois, and into Arkansas. The ice line mallards are stacked across northern Illinois, Missouri, Nebraska, and Kansas, but then there is a large gap until you get to the snow birds. Snow cover is limited in most areas all the way into North Dakota. Even though small bodies of water are frozen solid across the Dakotas, the Missouri River remains open. The latest survey from South Dakota hasn’t been release yet, but the number of mallards on the river will be staggering. They will continue to ride out the winter there until the river freezes or snow covers the abundant food sources along the river. Canada geese have been migrating in daily in areas of South Dakota, Nebraska, Iowa, and northern Illinois. The sub-freezing weather has many of them on the move even with the lack of snow cover in many places to the north. This year, we’ve seen the furthest southward push this early in a number of years. While the amount of snow cover isn’t abundant, dark geese still seem to be on the move. Hopefully this is a sign they know what winter has in store and they will continue to migrate south. Snow geese continue to be spread across much of the country all the way from the Dakotas to Arkansas. There are pockets of larger concentration all throughout the migration while specks have been noted across Kansas, Missouri, and Illinois. This past weekend, southern Illinois and southeast Missouri picked up a large influx of migrating specklebellies. The temperatures look to moderate over the next 7 days as the weather pattern reloads. Look for some frozen water to thaw by the middle of next week and waterfowl may scatter as new resources become available. The next weather system appears to start effecting the central plains by next Tuesday. As always, the weather will warm ahead of the system, then a sharp cool down as the low pressure moves through. For waterfowl hunters across the central part of the US, the amount of snow accompanying the system will determine how many waterfowl will migrate. A large arctic front moved across the country earlier this week and spurred a good waterfowl migration in many areas, but some places were left wondering where the ducks are. The front, which dropped temperatures 20-30 degrees in many places began it’s push south on Sunday. Not much precipitation was involved, but the drop in temperatures and strong north winds pushed many waterfowl south. The bulk of the good reports came from the central flyway where many teal, shovelors, gadwall, pintails, divers and even early mallards were reported moving into Nebraska, Kansas, western Missouri, and Oklahoma. Large concentrations of mallards made a move from southern Canada and North Dakota into South Dakota. Most water sources in North Dakota and Canada are predominantly frozen, but this weekend’s warmup could open some water back up briefly before another system ushers colder temperatures back in. Across the Mississippi flyway, little ducks and divers made moves in Missouri, Illinois, and Arkansas. We hunted the Missouri River in central Missouri and saw numerous flight birds the first couple hours of the morning, but then they stopped. With the approaching full moon, many ducks decided to migrate Tuesday night under clear skies. This left many hunters wondering why they didn’t see a migration. The ducks did migrate, just not during the day when it could have been noticed. The Illinois River Valley, which was holding over 800,000 ducks drop nearly 300,000 birds this week. The “mass exodus” was even captured on radar as pointed out by the biologist that surveys locations across Illinois. Larger numbers of mallards are currently in Minnesota and Wisconsin. Lots of reports of snow geese arriving in Arkansas have come in this week. They took advantage of the strong north winds behind the front and made their way south. These are leading edge birds and the rest of the snow goose migration is strung all the way north into the Dakotas. As the weather gets colder, these large concentration will continue their trek south through Nebraska, Kansas, Missouri, and Illinois. The large numbers of Canada geese are located across the Dakota, Minnesota, and Wisconsin. Some of the early migrators were seen in parts of Nebraska, Iowa, and northern Illinois. The areas they’ve entered tended to be their stopping point the last couple years. In order to get the goose migration further south, we need sustained cold temperatures and snow to cover their food source. The weather this week looks seasonal after a brief cool down behind a cold front on Sunday and Monday. Just like the last front, this one looks to not have a lot of moisture in the cold sector with it which will limit the snowfall potential. Strong north and northwest winds will accompany the backside and coupled with the full moon, some waterfowl could migrate, but we don’t expect a large movement of birds over the course of the next week.